You may not know, but Australia is filled with nutters, squeaks and squirts. We are some of the most common mythics you will find in the Land Down Under. You’ll discover nutters, squeaks and squirts in all eight of Australia’s environments. We are hiding in gumtrees, dug in caves, sailing on rivers, camped in deserts and living on mountaintops. Hey, you may have a little squeak living in your very own backyard and you probably wouldn’t know it. To help you become more ‘mythic-aware’, below is a brief description about nutters, squeaks and squirts. I am sure you will find us utterly amazing. Nutters can be found Australia wide. If you live in the bush, there is always nutters close by. Even if you live by the coast, in the desert or on top of a mountain, you can’t escape nutters. Fortunately, Australian nutters keep to themselves and out of sight (at least the mythic ones do). Nutters love the lazy life of taking many naps between generous meals of cake and cheese. They live in cosy communities which have cute cottages and shops. Nutters have a small magical ability which varies according to their environment. For example: bush nutters have sleep spells which they sometimes cast on people having picnics. When the humans take a nap they sneak in and scavenge the bread crumbs. 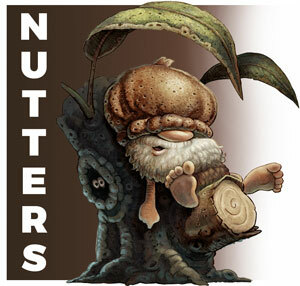 Nutters love a lazy life of eating, sleeping and playing games. Nutters you will find in different Australian environments. 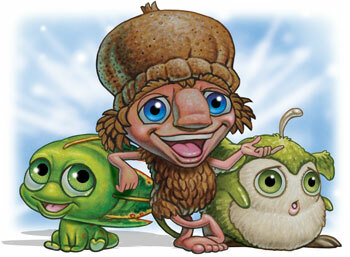 Squeaks are one of the cutest mythics you will come across in Australia – if not the world. They are approximately 4 centimetres high (give or take a millimetre). They are seldom spotted by people as their features naturally camouflages into the environment. Generally, squeaks have simple needs and don’t tend to make homes. They gather seeds when hungry and fall asleep wherever they happen to be. 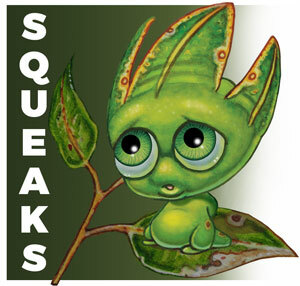 Squeaks can be found in the eight mythic environments of Australia. Each squeak is uniquely different in appearance; however, they all share the same magical ability – squeaks are indesquashable – they are rubbery like a human squash ball. This is fortunate; due to their natural camouflage they often are stepped on by large creatures. Squeaks are magically rubbery and indesquashable. Squeaks you will find in different Australian environments. Have you ever walked under a tree and have a big drip of water splash you? Well, you’ve probably entered the territory of a squirt and this mischievous mythic has just hosed you with a warning to move on. These cute little water-bags are named after their squirt-magic. They have a little antenna on top of their heads that extracts water from the air – even in the dry climates of the Australian desert. 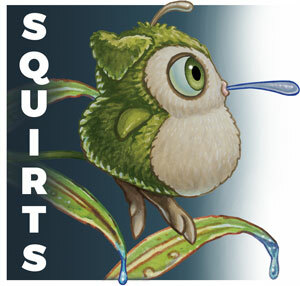 Squirts generally live in the same environments as squeaks; however, both these cute mythics have been at war with each other for hundreds of years for reasons long forgotten. Squirts and squeaks are at war with each other for reasons unknown. Squirts you will find in different Australian environments.